Main Journal- This is installed on the cylindrical block. Connecting Rod Journal- This part connects the small hole to the cylinder piston. How are forged crankshafts different from cast crankshafts? Lesser Flaws- While the cast crankshafts come with a series of defects like sand holes, oose, segregation; the forged crankshafts are more stable in performance with less amount of material and tissue defect. So in one word, forged crankshafts provide a better internal structure than cast crankshafts. More load cycles- As per a recent study, the forged crankshafts can handle number of loadings in its lifecycle than the cast shaft. Light Weight- The forged crankshafts are 18% lighter than the cast shafts without degrading the performance level. Economical- The weight reduction, in turn, reduces the oil consumption; making forged crankshafts more economical than cast crankshafts. The fuel efficiency benefits both the vehicle performance and the user. Low Maintenance- blind flanges develop cracks slower than their casted counterparts. So forged shafts have a prolonged life without the need for repair or replacement. 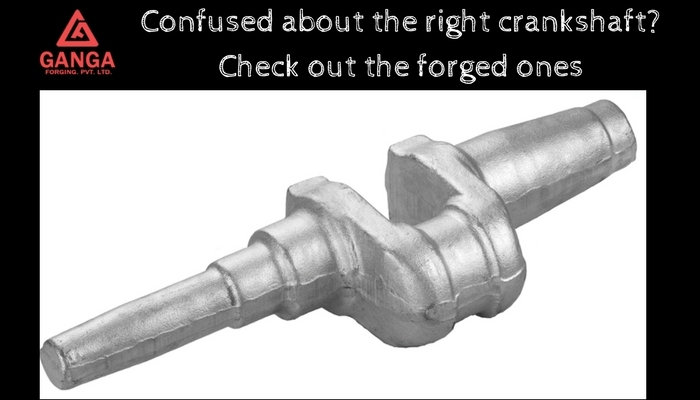 Forged crankshafts have 36% more fatigue resistance than the casted ones. Heat Resistant- When a casted and forged crankshaft were tested together under variable temperatures, the forged ones showed 9 times better ductility and toughness. What are the features of a good crankshaft? A good crankshaft is the life of your engine. Hence you must choose one which has the following features to make sure that your engine gets the best treatment. Well lubricated- The crankshaft should be well lubricated because a rotation of this part leads to the power of the engine. A Crankshaft is also the driving force of the whole mechanical system. Made from high end compacting/ forging process- Forged crankshafts need to be rigid; have to withstand a lot of pressure and must have good wear resistance. This is the reason you cannot compromise on the quality of crankshaft and 4340 steel is considered to be the best. This material not only ensures shock absorption, abrasion resistance, crack safe but is also economical. How to ensure a long life of crankshafts? Crankshaft fractures are one of the biggest issues faced by the manufacturing industries. So how will you prevent fractures and give a prolonged life to these essential engine accessories? Select the right engine oil- As already stated smooth rotation of the crankshaft is a must for a powerful engine. Often in the pursuit of saving oil, crankshafts are not lubricated properly or are greased with low-quality oil. This leads to tile burning and serious damage to the forged crankshaft. Do not overload- Understand the capacity of the crankshaft before loading? Overloading of forged crankshafts leads to local stress and hence breakage. Racing cars and serious street performance vehicles- Whenever you need a powerful and smooth running automobile engine, you need forged crankshafts. On cars with manual transmissions- This kind of cars require forged crankshafts because these cars use clutches which are tough on the drive train and cause huge impact when dumped. A forged crank is strong enough to handle the pressure of the clutches. How are forged crankshafts made? how these super-powered crankshafts manufactured? This is a completely different and advanced process of metal forming. In this method, a hot piece of rolled steel is placed between heavy dies and in the pattern of cranks. Under high pressure, the metal takes the shape of a crank. This creates a strong crankshaft as the internal grains get aligned in a better way. Switch to Forged Crankshafts India today to get an extraordinary driving experience.